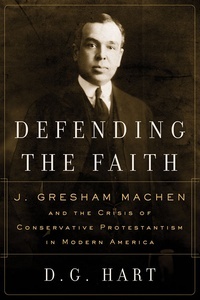 In the early twentieth century J. Gresham Machen emerged as one of America’s best known Protestant intellectuals and a widely respected fundamentalist. But as an opponent of Prohibition and defender of civil liberties, Machen became an improbable ally of secular intellectuals who sought to liberate cultural and intellectual life from Protestant dominance. How could America’s most articulate spokesman for traditional Christianity earn praise from the likes of H. L. Mencken and Walter Lippmann? In Defending the Faith, the first critical biography of this intriguing figure, D. G. Hart reveals the complexity and broader implications of Machen’s religious conservatism. The son of a prominent Baltimore family, Machen studied at leading universities in the United States and Europe and taught for most of his career at Princeton Theological Seminary. Machen’s significance, Hart explains, lies in his apparent contradictions. He defended the historical truthfulness of the New Testament, for example, yet promoted critical biblical scholarship. He advocated private Christian academies, yet opposed Bible reading and prayer in public schools and championed the modern university. Hart argues that Machen’s defense of traditional Christianity—and his criticisms of mainstream Protestantism—actually complemented many of the forces of modernity. Demanding that churches restrict their activities to religious endeavors, Machen rejected the project of preserving “Protestant America.” His insistence on strict enforcement of Calvinist orthodoxy in the Presbyterian Church went hand in hand with ardently libertarian views on many social and political issues. In its clear portrait of this neglected American intellectual, Defending the Faith adds nuance to the history of religious and cultural conflict during the 1920s and contributes to ongoing debates about the nature and influence of fundamentalism in the United States. Amazing biography on an interesting man.